And now for something completely different; a steel bowl decorated on the inside with an oil painting. The subject is the SS (Steam Ship) TARAHNE located in ATLIN in British Columbia, Canada. 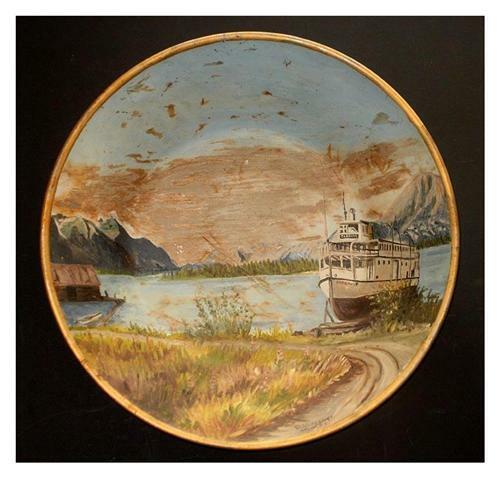 When the gold rush was over and the British Yukon Navigation Steamboat Company (BYN) was set up to run riverboats on the Yukon River in a hybrid, and much cheaper, transportation system. The economic and environmental conditions of the 20th-century Yukon provided the wood-fired, steam-powered, wooden riverboats of the BYN a unique technological niche in transportation history. Three vessels of the fleet, SS Klondike (Whitehorse), SS Keno (Dawson), and MV Tarahne (Atlin, BC), are preserved as heritage sites. Atlin is a community in northwestern British Columbia, Canada, located on the eastern shore of Atlin Lake. It can be reached by the Atlin Road (Yukon Territorial Highway 7) that is maintained jointly by the British Columbia and Yukon governments. As of 2004, there are 450 permanent residents. The name comes from Áa Tlein, the Tlingit language word for "big body of water". The surrounding area has been used by Inland Tlingit people for many years and the community is home to the Taku River Tlingit First Nation. What this artifact was doing in Hampshire (England) I have no idea.